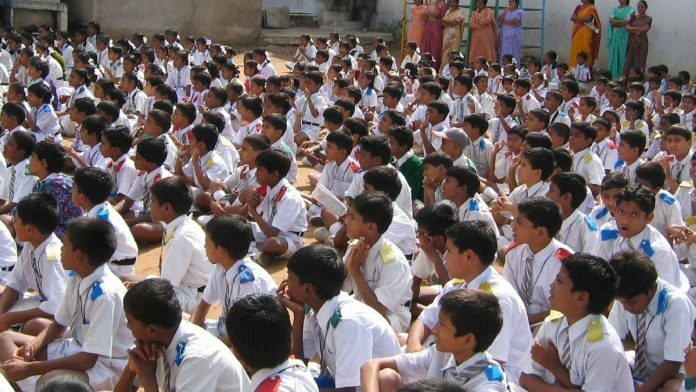 New Delhi: A petition challenging the mandatory recitation of Sanskrit shlokas and Hindi prayer during the morning assembly at Kendriya Vidyalayas across the country was Monday referred to a larger bench by the Supreme Court. “Religious instructions in school is a question of seminal importance,” a bench comprising Justices Rohinton Nariman and Vineet Saran said as it directed the matter to be placed before Chief Justice of India Ranjan Gogoi to be listed before a larger bench. The case reached the apex court in 2017, when Veenayak Shah, an advocate from Madhya Pradesh, challenged the Revised Education Code for Kendriya Vidyalayas Sangathan, which mandated the recital of common Sanskrit shlokas and a Hindi prayer in the assembly. According to the rules, Shah pointed out, all students, irrespective of their religion or belief, are required to follow the practice, chanting the shlokas and prayer with their hands folded and eyes closed. “All the teachers share the collective responsibility of supervising the assembly and making sure that every student folds his/her hands, closes his/her eyes and recites the prayers without fail,” the plea added. “…Parents and children of the minority communities as well as atheist and others who do not agree with this system of prayer such as agnostics, sceptisists, rationalists and others would find the imposition of this prayer constitutionally impermissible,” he said. Shah also noted that students who didn’t follow this rule were “punished and humiliated in front of the entire school”. Shah added that the rule in question was a violation of Article 28 of the Constitution, which prohibits state-funded institutes from imparting religious instruction. The Jamiat-Ulema-e-Hind, a premier organisation of Muslim scholars, has also sought to challenge the Kendriya Vidyalaya policy in the Supreme Court, citing a 1986 apex court direction that quashed circulars mandating students to sing the National Anthem at a Kerala school. The precedent case was centred on the expulsion of students who identified as Jehovah’s Witnesses, a Christian denomination, for not standing while the anthem was being sung. It would have been better if the writer had cited the shlokas and Hindi prayer mentioned in the article.